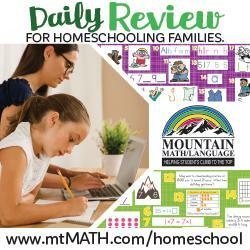 Mountain Math/Language is a unique supplemental, but thorough, review program that can be used with any math curriculum. The Mountain Math daily review reinforces the concepts covered in the main curriculum, according to what the teacher considers necessary for each day in only 10-15 minutes per review session. The daily review is offered in 3 formats – Online, projected on a Smart Board, at a Math Learning Center or as a wall-mounted Bulletin Board Kit, with many hands-on tools, such as facts cards to use in presenting to the class. The student has the Mountain Math Workbook at his/her desk and performs the problems that are on one of the 3 formats. The problems change each day, but the printed page layout remains the same. This constant review also provides an excellent and accurate assessment of a child’s progress and can signal when the student is ready to move on to the next concepts . . . or not. Mountain Math’s Daily Review also provides an excellent warm-up to get young brains moving in the math flow. It can also serve as part of an assignment in conjunction with the main material. One of the important aspects of the MM package is that it presents the number facts in words as well as Arabic numerals, place value and expanded notation, providing the students with the complete picture of the information. Therefore, 1201 is also one-thousand-two-hundred-one; it is 1 thousands, 2 hundreds, no tens and 1 ones, etc. The worksheet has a variety of different exercises performed with the same “master” daily number, so the student grasps all of the facts about that master number – what is 10 more than the master? 10 less? 100 more? 100 less, and so on. The master number changes each day, but the operations using it remain the same. This makes a deep learning groove as the foundation in the child’s math awareness. The Learning Center package and the Bulletin Board Kit, available for grades K-8, both offer the following for each grade level: 32 weeks of daily reviews, Instructions, a Master Student Response Sheet, printed on high-quality cardstock and assistance from the Mountain Math people. There is no suggested order for the Bulletin Board Program, in order to provide the most flexible program possible to parents as they use it. Mountain Math is in-line with the Common Core standards and requirements, so anyone who follows those standards – or is concerned about them — can be assured of compliance. For complete information, pricing and the full line of products, visit the website, www.mtmath.com/. E.S.